The following precautions can help you save money and gain quality and quantity of coarse sand/material during the purchase. The three types of materials/ coarse sand is found at ‘Quarry Site’. Each material has different impact on the strength of the building. This type of material is the best for use in construction work and gives full strength of mortar. This type of material is cheaper having more silt/clay and un-graded material. This is generally 20% cheap. Caution:The following precautions help you can save Rs.2000 to 3000 if you get coarse sand 1000 Cft Truck. The supplier/truck owner carries sub standard material of above two cheap qualities of ‘Coarse Sand’ at the cheap rate and he tells house owner that carried material is the best material because house owner does not know much about the quality of material. If the owner has some knowledge about sand and asks for the quality of ‘Coarse Sand’ and objects about silt contents in coarse sand, the truck owner or supplier asks to sprinkle some water on sand and assures that the material will be the best material. House owner must be very careful while purchasing ‘Coarse Sand’. He must have latest knowledge about quality and quantity of the material. a. Cheap quality of the coarse sand. b. Labor to sprinkle water on the coarse sand. c. Quantity which is less after washing coarse sand because silt contents are washed away from the sand. In this way the quantity of the coarse sand is reduced. d. Rates because house owner has not much knowledge about market. e. Measurement which the house owner generally does not know. The supplier tells a lie by saying more quantity of the material and unloads the truck. Usually he unloads the truck during night or in early hours of the day in absence of house owner. In some cases he produces false receipt of ‘Quarry Site’. a) About Rate: House owner should collect rates from more than 3 or 4 suppliers. He should also collect the rates from few truck owners who stand their trucks with full of material at the early hours of the day on prescribed place in every city/town. b) About Quality: When you take the supply, check the quality of material. Never accept fine and silty material because this material is harmful as stated above. c) About Measurement: Where the supplier or truck owner suspects that the house owner may measure the truck in day time, he applies following methods to befool the owner. He stops the truck at some distances from the site and gets the material loosen by spade and sprinkle water on sand in the truck. 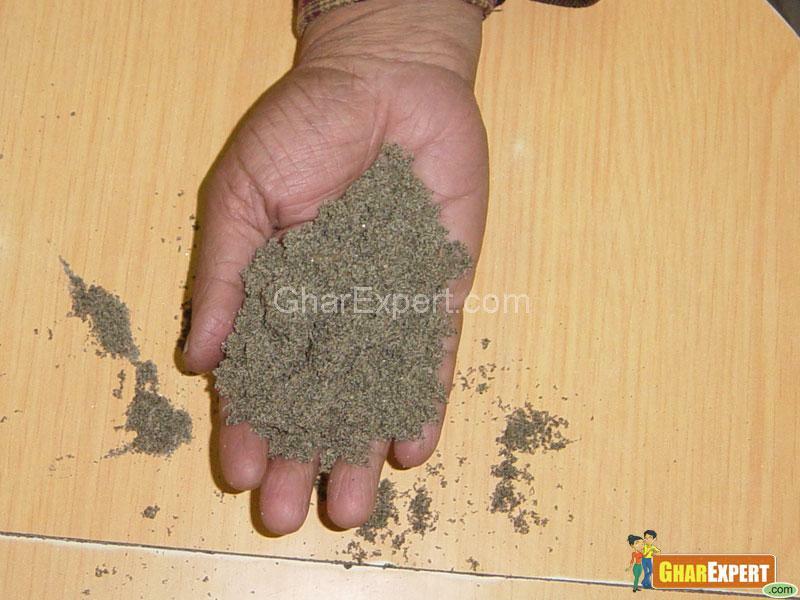 Due to spading and the water sprinkled over sand, the sand becomes bulky and it gives more height. Hence he charges on more quantity. He also tries to make the house owner fool in calculation for example if the measurement is 3 feet 6 Inches, he calculates it as 3.6 but actually it is 3.5 feet. He also tries to measure the height at the backside where the height is raised with the help of spade. a) When one takes supply of material, he should measure the height of material in the truck. If the material is pressed by your feet when you climb on the material in the truck, you should think that the material has been made loose with spade by truck driver; you should reject the material. If the material is not pressed by your feet, it is O.K. b) You should take the height with the help of iron rod by inserting it into the sand, but care should be taken if the truck driver takes measurement of the height, he can take the other height from low place and takes average of 2 or 3 points in heights. Take the length and width of truck after unloading of the material. c) Never compromise on the measurement of the material at the ground after unloading as this will give more quantity. d) Try to get the material in cash terms and payment made by you after measurement of the height, length and breadth as the truck driver/owner charges less rates on cash payment, direct from house owner as compared to the supply taken from suppliers.